Two years ago, we sold our 2900 sq. ft. house in Chapel Hill, North Carolina where we had lived for 22 years. As you can imagine, it was full of furniture, books, artwork and things that we had collected and inherited over the years. So we had the challenge of sorting through everything and figuring out what we were going to take to Costa Rica. We gave (forced) our children to take most of the family treasures. A few treasures went to other family members. The new owner of our house bought some furniture and oriental rugs the kids didn’t want. The rest of our worldly possessions – mostly books, kitchen and general household goods, a few paintings, tools and a couple pieces of furniture – were put into a storage unit as we had decided to start off renting a furnished house in Costa Rica. While we were back in NC, we went on a buying frenzy. I bought new bed linens, towels and kitchen items that are difficult to find in Costa Rica. We spent hours at Lowe’s picking out appliances, kitchen and bath hardware, light fixtures, and tile for mirror frames. Eddie bought a lot of things on-line for the new house and pool. Every day we were receiving UPS or Fed Ex deliveries. 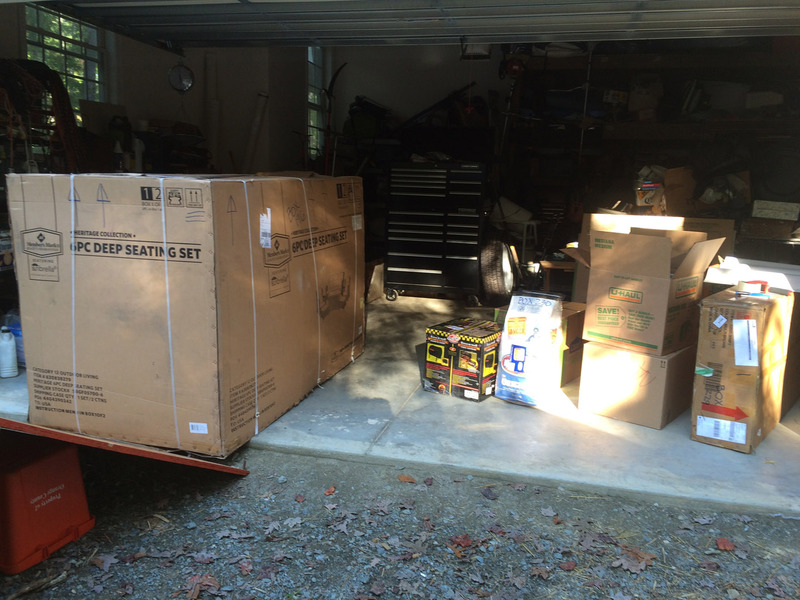 The boxes were taking over the house and garage! Not only that, we had to open everything and re-pack it all to survive a trip on a ship. Jane and Mark were very patient and didn’t complain too much about our invasion of their home. Mark even let us borrow his new truck for transportation from their house to the storage unit. We couldn’t have managed without that wonderful truck! Loading the last of the boxes from Mark & Jane’s garage onto Mark’s truck. 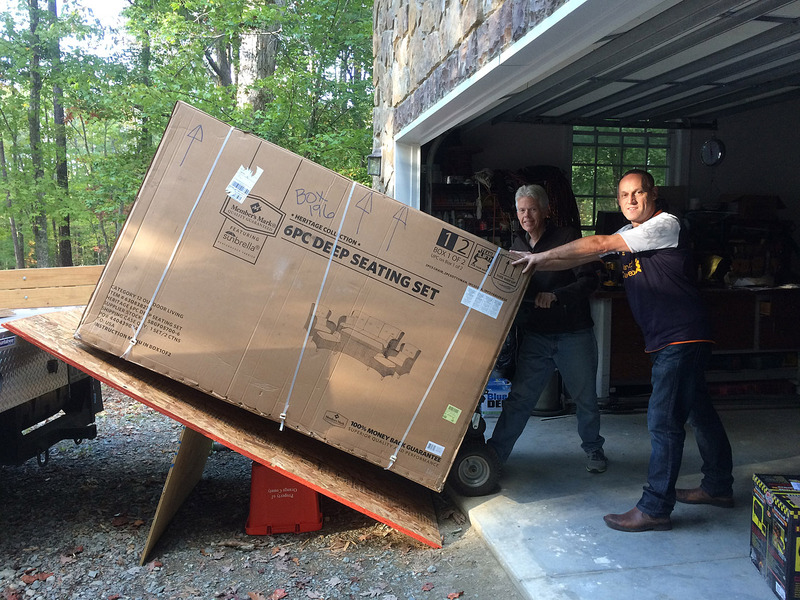 Sean, a friend of Mark and Jane’s, helped Eddie load the huge box of outdoor furniture. Our last week was absolutely crazy busy! The refrigerator and microwave we ordered weren’t going to make it in time from the warehouse, so we had to choose different models that were available in the store. 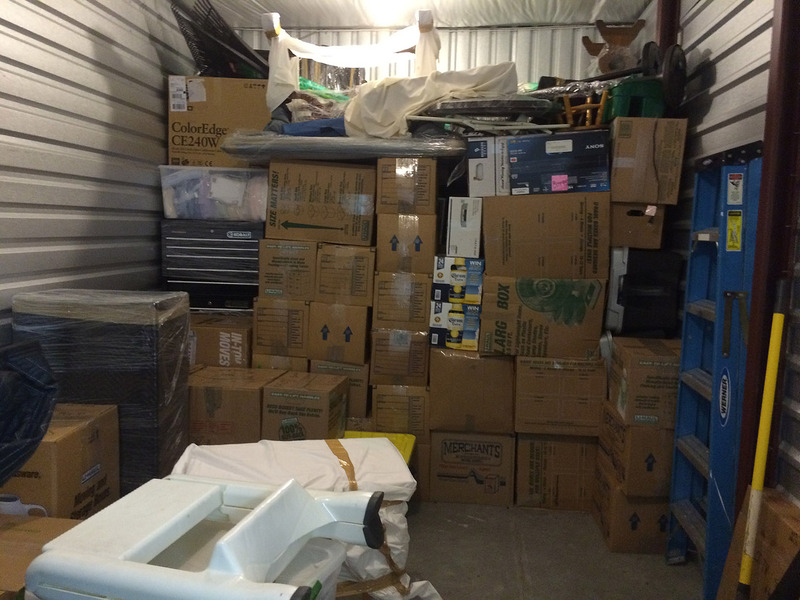 We had filled up our 10 ft. by 20 ft. storage unit and needed more space. Eddie arranged to use a smaller storage unit near our big one for the appliances and some of the boxes from the house. We still had a truck load of things in the garage that would have to come with us the morning of move as there was no more room in our storage units. 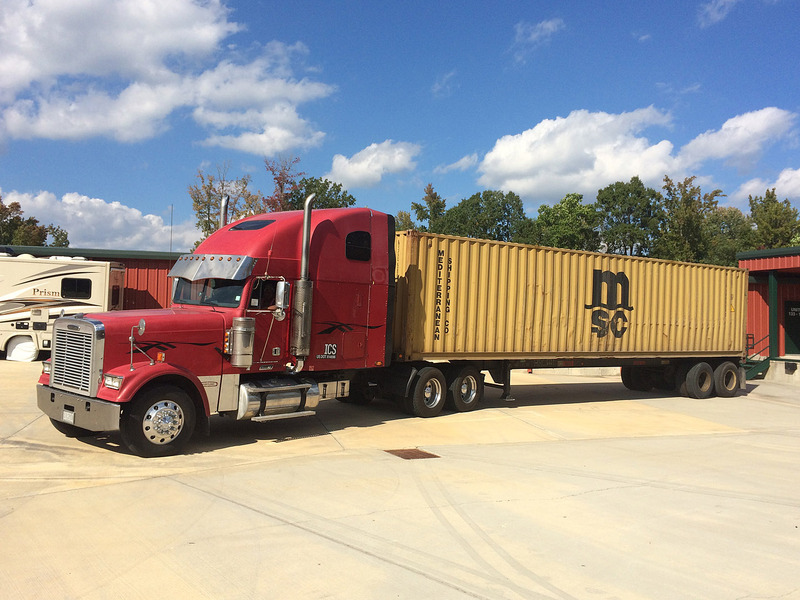 Earlier in the year, Eddie got a few quotes from shippers and decided to use Logistic Management Services owned by Mike Rappaport based out of Cartago, Costa Rica. We used them to have a pallet shipped with some things shortly after we moved to Costa Rica almost two years ago and his company did a great job. 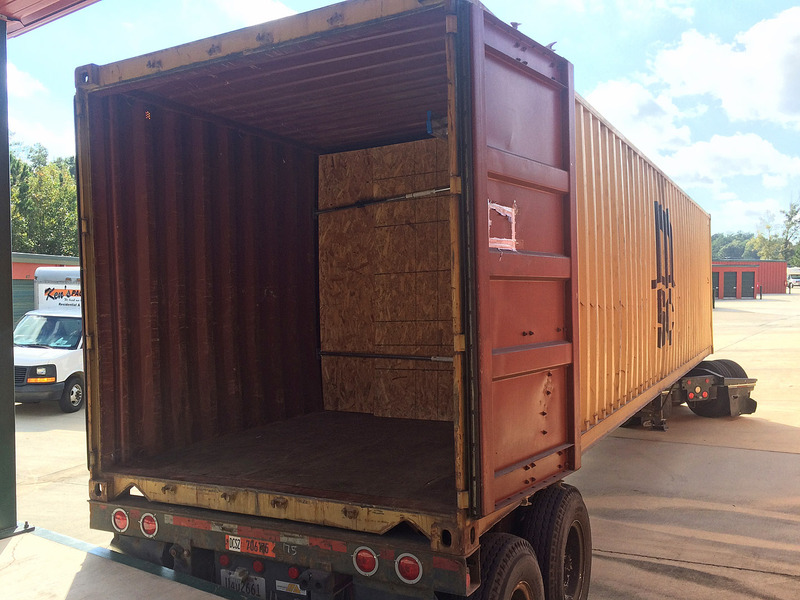 Eddie made a reservations for a 40 ft. container to arrive at our storage unit on October 13th, four days before we were scheduled to return to Costa Rica. 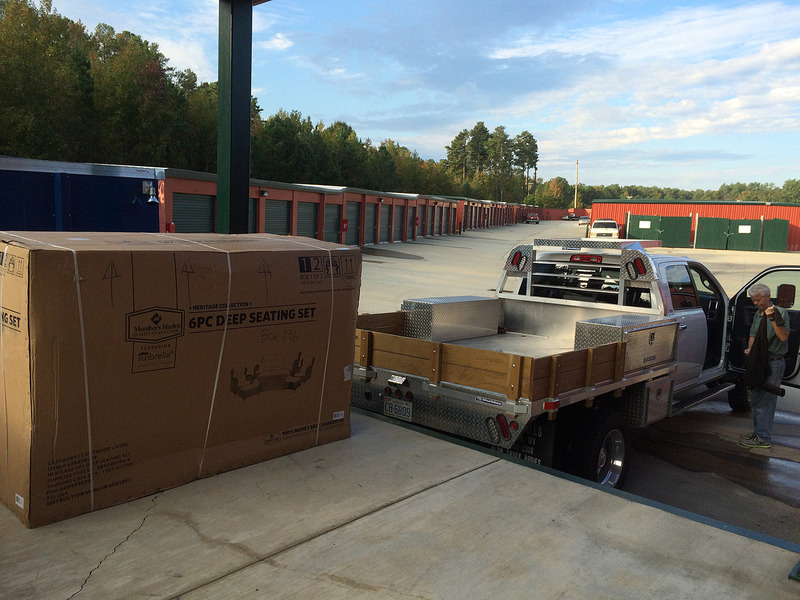 The shipping container was supposed to arrive at our storage unit at 9 a.m. and we were allotted two hours to load it. Eddie had hired a crew of four moving guys to load the container for us. He had a tough time finding movers available on short notice because we didn’t get a confirmation on the time the shipping container would arrive until about a week prior. The morning of the move, Eddie and I were at our storage unit at 8 a.m. unloading the last of our things from Mark’s truck onto the loading dock. About 15 minutes before the shipping container was scheduled to arrive, I went out to the main gate to wait for it and I waited and waited and waited. Finally, Eddie called to let me know that he had contacted the shipper and was told the driver was going to be late due to a mechanical problem with the rig. 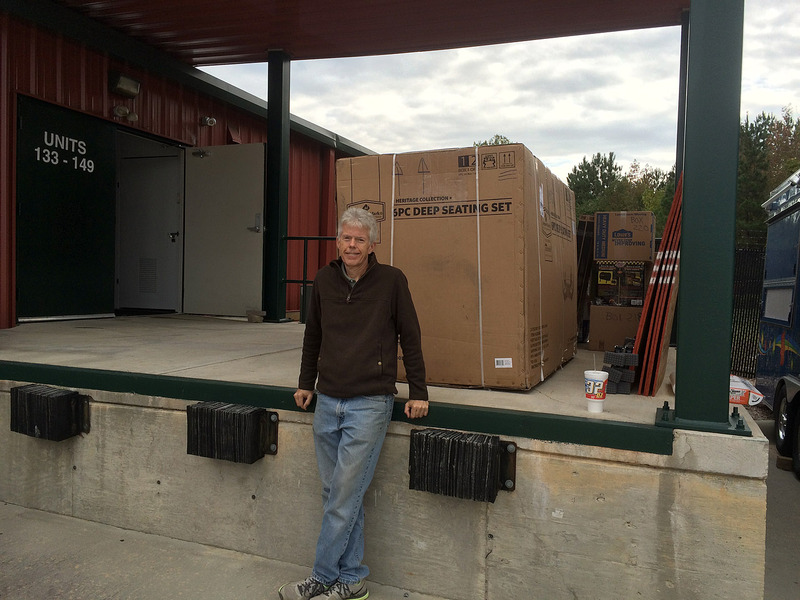 The two of us managed to unload the last truck load onto the loading dock before the container arrived. Waiting for the container and movers to arrive. Fortunately, the movers arrived an hour or so late, but still before the shipping container. 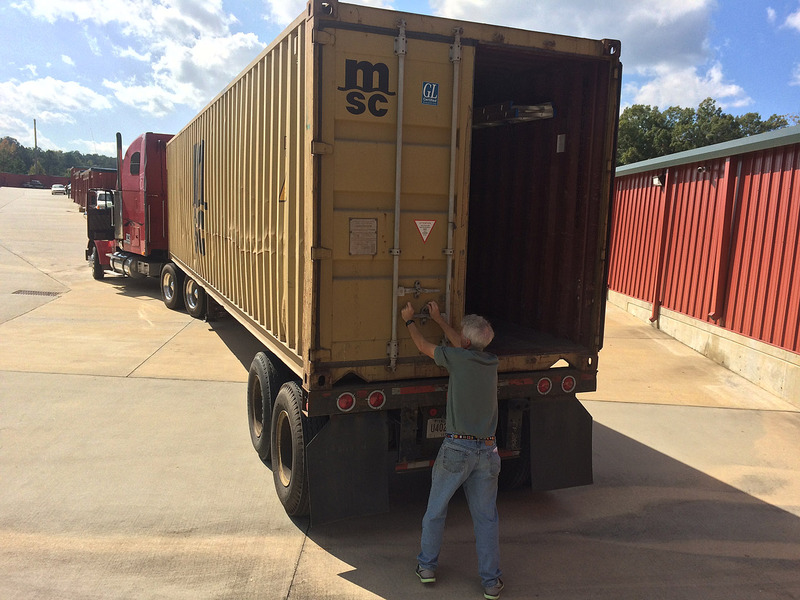 While waiting for the container, they started to unload our stuff from the storage units onto the loading dock and into the main entrance area. A few of our son’s boxes had gotten mixed up with our boxes, so I spent time searching for them and repacking some things that were in clear bins into boxes. 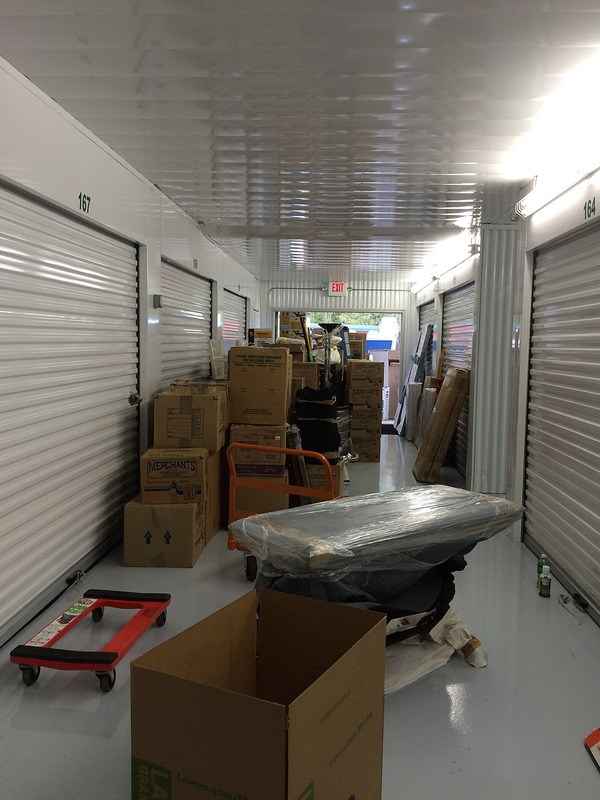 Our 10′ x 20′ storage unit as it is being emptied. Stuff queued up in the hallway of the storage facility waiting to be loaded onto the container. The shipping container didn’t arrive until 11:30 a.m. The guys started loading up right away. Of the four guys we hired, only three did any work, so Eddie had to help out. It’s a good thing he is an excellent packer! It was a bit stressful with the delays and the one mover guy who wanted to stand around, B.S. and not do any work. That guy would distract the other guys. Meanwhile, I was fussing at them all to be careful with certain boxes they were tossing around. Eddie had to calm me down a couple of times as it was apparent that I was about to freak out. I think the movers were all glad they were not married to me! They were really feeling sorry for Eddie. The container is loaded. 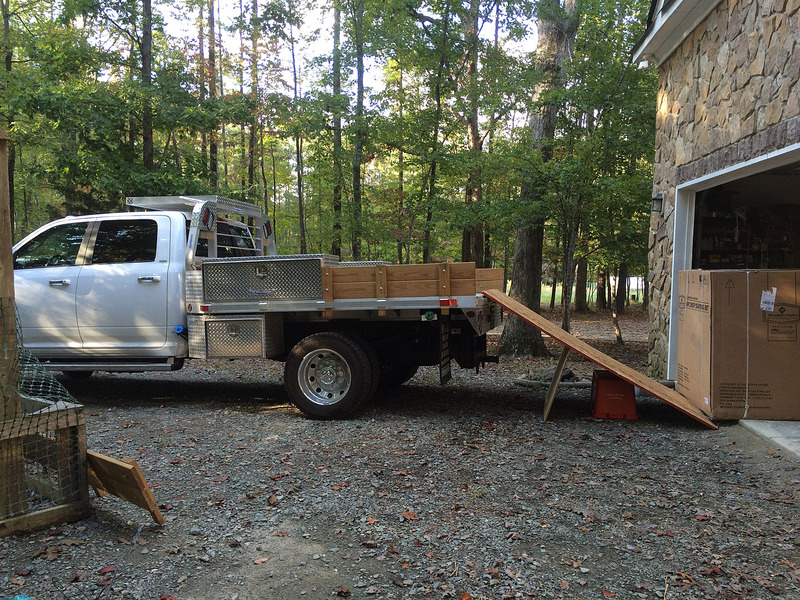 Sheets of plywood and load lock bars secure everything in place. Eddie is closing the container doors and puts on the seal. It ended up taking a little over three hours to load the container. The driver was really nice and she didn’t charge us extra…perhaps because she was late. She drove directly to the port near Norfolk, Virginia and off-loaded the container to the ship. The ship sailed on Friday, October 16 right on schedule. We were told it would take between three and four weeks for our stuff to arrive at the warehouse in San Isidro de General in Costa Rica. That includes time in customs. All of the things to be installed in the house will get transported to the property as we need them, and the rest will remain in the warehouse in San Isidro until the house is finished. wowie! Good job!! It looked like quite a project! Moving is never fun, and this certainly confirmed that. Congratulations that it even happened the same day!! Way to go! You’re right…we were fortunate that the move happened on the scheduled day! There were a few moments when we were thinking that we got “stood up.” Glad it all worked out! What an amazing adventure! I was worn out just reading about it all. Hopefully the hardest part of the move is now behind you. Not so sure the hardest part is behind us just yet. 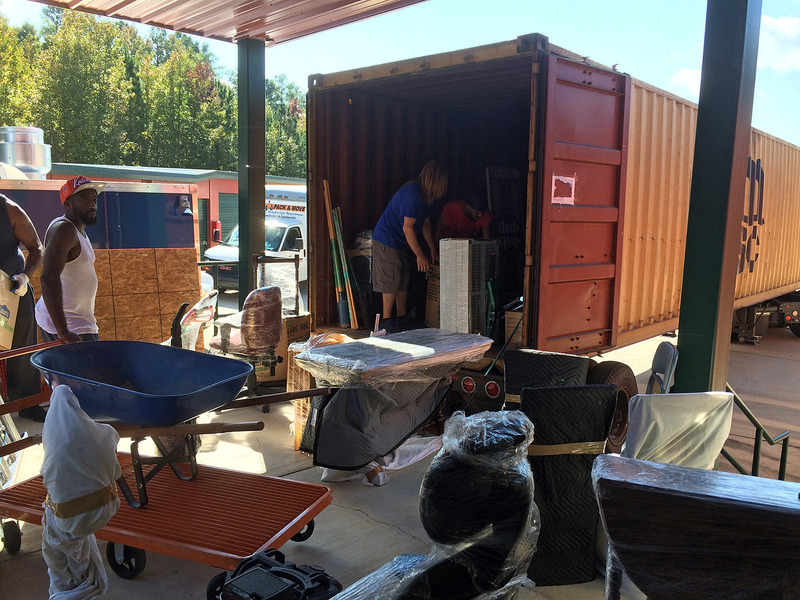 We still have to get the container unloaded into the warehouse with the things we need for the house construction easily accessible. Then, when the house is finished, we need to arrange to get all our stuff up our steep hill. Always an adventure!